Last week we became proud winners of the CN Group New Business of the Year award, and enjoyed a wonderful evening at the Rheged Centre, where we were wined and dined. These are the kind of events that we generally don’t frequent so it was actually good fun to be there, and winning the award just made the evening a little bit more special. While the award is currently adorning a shelf in our living room t, it was the description of our business which made more of a lasting impact on me than the award itself. As part of the process of receving the award we received some brief feedback and we were essentially described as being ‘innovative’ and having a clear plan for developing the business into the future. I’ve never really thought of us as being ‘innovative’. It seems too grand a term for us! When I first think of innovation, I think of people/companies who are cutting edge in their field. This weekend a large hospitality event took place in Milan. Two espresso machine manufacturers highlighted new innovations in their products – the ability to weigh espresso shots built into the equipment. This is what comes to mind when I think of innovation. But then, perhaps, innovation is also a relative term. On a global scale the ability to weigh espresso shots is innovative but at this moment in time it is likely to have little or no impact within Cumbria and, aside from my desire to own one, it is unlikely to have an impact within our business. I need to think of innovation within the context of our business, our customers, our potential customers, and the locality in which we operate. Innovation in this respect is about reflecting on what works, and what doesn’t, it’s about thinking about what we want to achieve and how we might go about getting there. When expressed in these terms then I can see why the judges described us in this way. Over the past couple of years we’ve attended various events to promote our product in the local community – these have ranged from small farmer’s markets through to large food festivals. During this time we’ve adapted our approach, trying to learn from our successed and failures, and this recently culminated in our approach to a recent local food festival. We were a lot more strategic in the way we approached the festival. We asked ourselves a simple question at the outset – what do we want to achieve over the course of the weekend? Looking back at the festival I’m sure many of the participants would have wanted to sell as much of their product as possible; more than likely they failed in their efforts. I believe this is the worst approach to adopt during a food festival. We took a different approach: for us it was about raising our profile, it was about getting as many people as possible to taste our coffee. We wanted people to notice us, to talk about us and to appreciate our coffee. We then grappled with how we might achieve this. Initially we thought about offering samples; we could bulk brew coffee and offer people small tasters of each. There is a flaw to this approach. 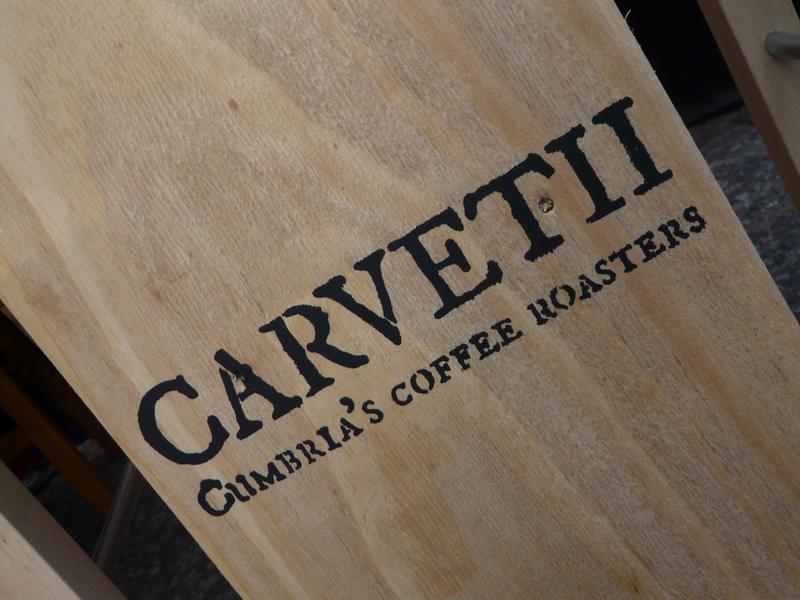 Speciality coffee is in its infancy in Cumbria and we have a long way to travel before people appreciate the differences between different origins; we needed a way of getting our coffee closer to the coffee drinking experiences of the public. And so we decided to give away cups of coffee all weekend. With an espresso machine on the bar, and a typical coffee shop menu, members of the public could come along and enjoy their usual beverage made using our coffee. We didn’t want to charge as this would dictate the relationship between us and the public – we would essentially be serving them. When the exchange of money is taken out of the equation, when someone receives something of quality for nothing, it presents us with so many more opportunities to engage in discussions about our product. Throw in some seating, images of coffee production, coffee books and some upbeat music, and we managed to create a stand which became the focal point of the event. People queued for long periods for a coffee, and we more than happy to do so. Seeing a queue drew in even more people – all the time they were immersed in our brand. Feedback about the taste of our coffee was overwhelmingly positive, as was the perception of our brand. 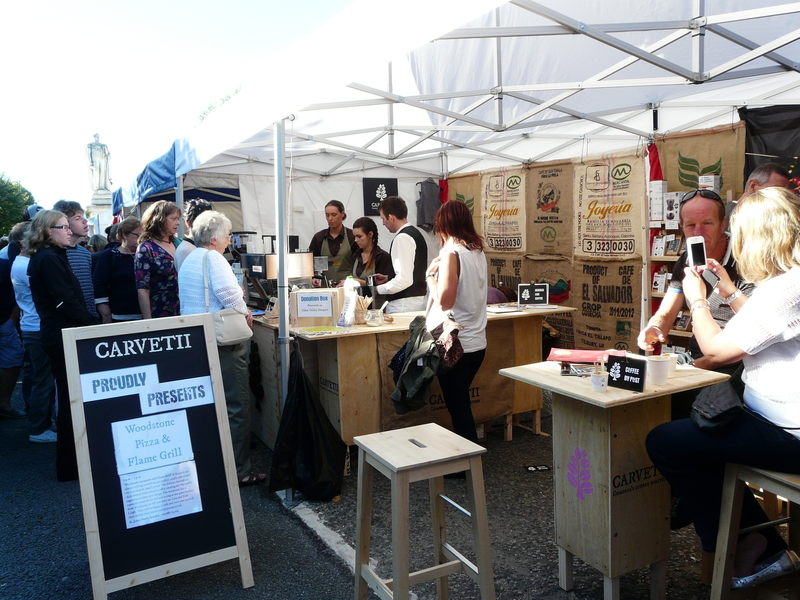 And interestingly we sold more bags of our coffee over the weekend than we have at any other festival; in fact despite giving away over 1,200 cups of coffee, and 130 bags of coffee, we pretty much broke even for the event. The actual impact of Taste Cumbria is yet to be fully felt. We’re currently tracking hits to our website, and these have increased substantially over the past three weeks. More importantly our online sales have improved in the three weeks since Taste Cumbria. We’ll continue to monitor web traffic in the coming weeks and months to see if this level is maintained. Many people have given us positive feedback since the event, and a few have suggested they might follow a similar theme themselves next year. We would really welcome that. Too many traders turned up at the event with the mindset to sell, sell, sell. Taste Cumbria is a festival of all that is good about local food; it is not supposed to be a glorified market. We already have plans in place to build on the success of this year, plans which we hope will engage even more with the public – well you wouldn’t expect anything less from an innovative business!